We discovered the gorgeous beaches of the northwest part of the island in Isabella - definitely a postcard area! We swam at one beach, then drove into town where we ate at a lively outdoor restaurant. There were lots of people gathered around a small building with outdoor grills drinking, eating and dancing to music. We ordered chicken and beef on a stick with hot sauce and enjoyed the delicious meal on the beach! It was a really authentic Puerto Rican place - the loud music and gathering of people seemed to give insight into the laid back culture! We then visited a beach with sand dunes - it too was beautiful. We climbed in the rocks and admired the beauty of the enormous ocean! 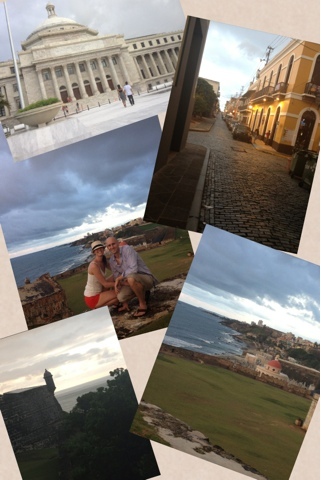 After the beach we headed into old San Juan. We viewed the fort and loved the vibe of the colorful city. The fort, Castillo de San Cristóbal, was built in 1783 by Spain to protect the city. The history behind the fort is amazing. The structure against the skyline was illuminated by the sun highlighting the architecture! We walked around, took some pictures and did some shopping. While we were eating it decided to start raining and the city was flooded in spots! There was rain up to your knees in some intersections! The architecture and beauty of the buildings was a site to see even in the rain! DIY Shell Jewelry ... Straight From The Beach! Kentucky Derby - What a Trip!